The whole point of marketing your organization through social media or email marketing is to get your audience to take an action — purchase something, register for an event, read something, engage with your content, or form an opinion of you. But if you’re putting too many steps between your readers or followers and your call to action, they might not follow through. If you want people to take an action, don’t link to your homepage and expect them to figure it out. Your audience doesn’t know your website as well as you do, and they’re not going to take the time to explore page after page until they find the right one. 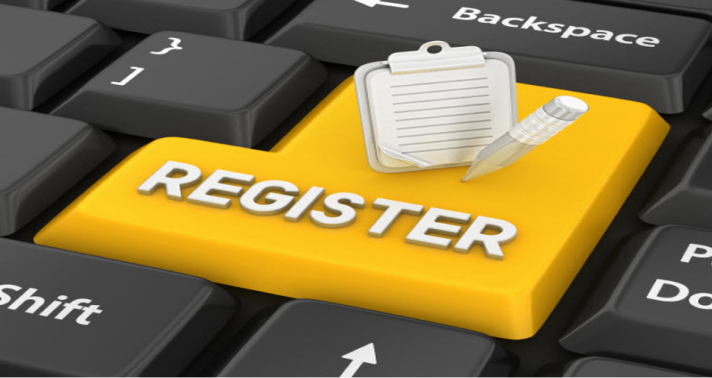 Link to a product page on your website, your event registration page, a blog post, or wherever else your audience can take the exact step referenced in your call to action. 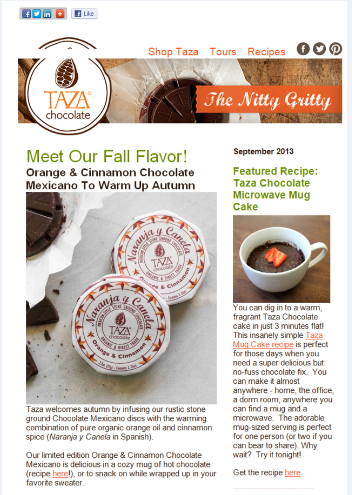 In this example, Taza Chocolate writes about their newest chocolate in their newsletter, and links to the specific product page that lets customers click and buy immediately. If you’re asking someone to follow through on a call to action on Facebook, give them as much information as they need to make the decision now. Let them know what to expect on the other side of the link you’re sharing. 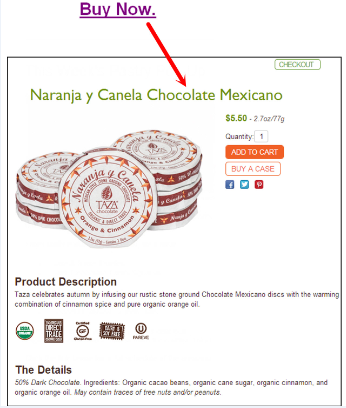 The price of an item, an event date or a blog post topic could be the reason that someone follows through on a call to action. 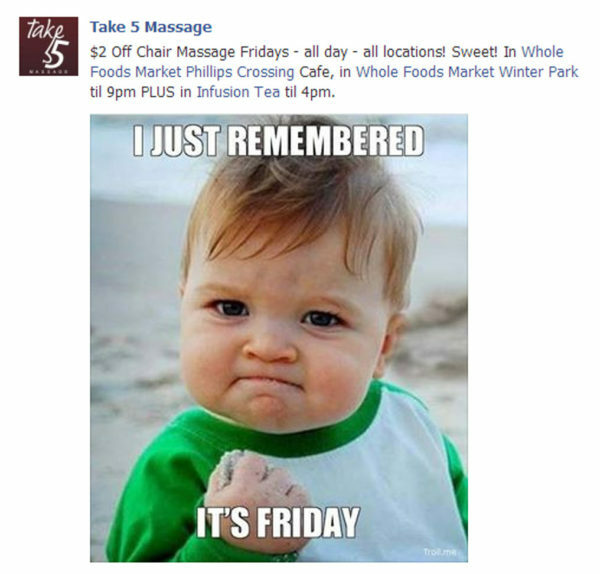 Take 5 Massage does a good job of posting all necessary details. They share discounts on their Facebook Page and then give their followers everything they need to know, including times, locations, and links to the Facebook Pages of promoted locations. Don’t make your audience scroll through a long, wordy email to get to the call to action. Keep it short and sweet. Focus on one call to action in your message so that your audience knows exactly what you want them to do next. In this example from the Manchester Animal Shelter, the call to action is clear. 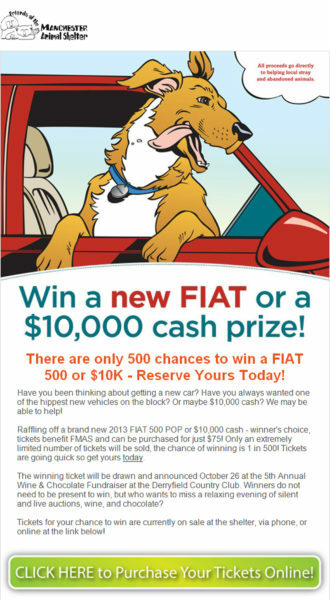 This entire email is about a fundraising raffle, and you don’t have to scroll to take that next step. There’s a giant button that’s linked to the website to purchase raffle tickets. When it comes to calls to action, make them easy to find and easy to act upon. If you give customers the right information and resources from the beginning, they’ll be armed with the knowledge and tools necessary to take the next step.